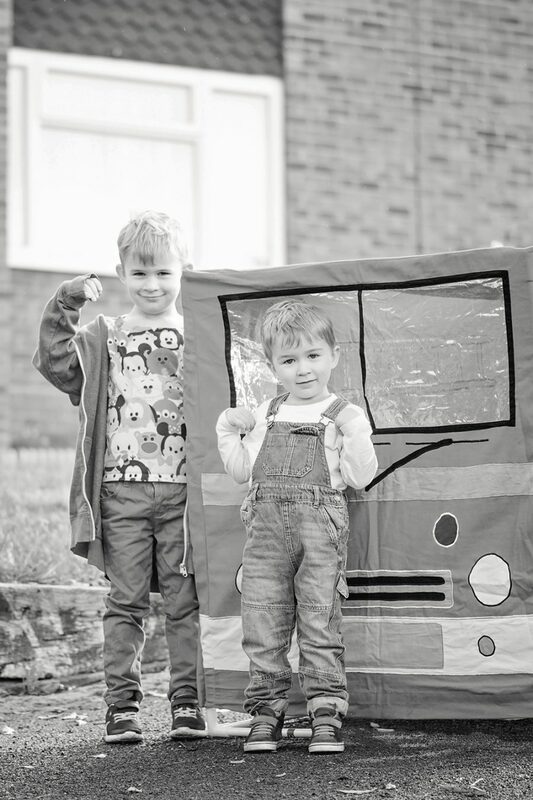 We must have been through about 10 play tents and houses since Jensen was born – and none of them has lasted very long sadly. We lose the poles, the poles are too thin and break, or they’ve been some kind of metal flexible frame that’s warped and we’ve given up. Or, even worse, they’ve been the pop up kind that we can’t disassemble no matter how many times we’ve looked at the instructions of a smug looking person with a freshly folded down play tent in just three moves. 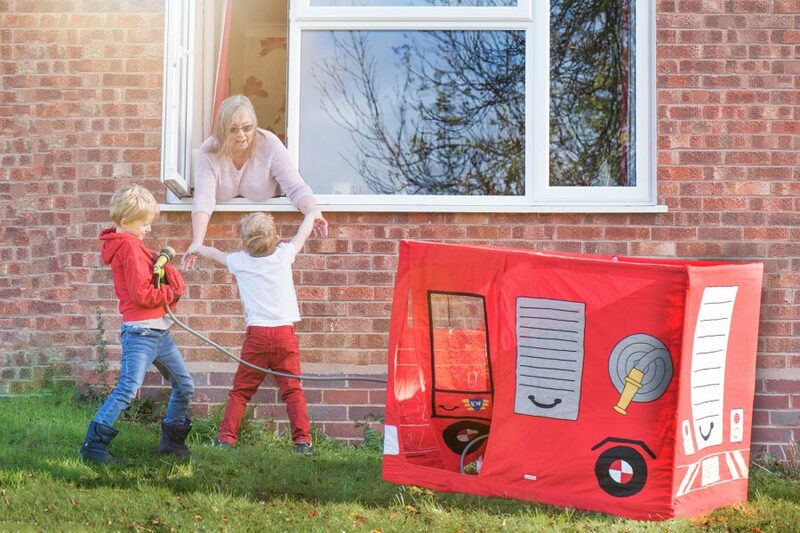 We were offered the chance to review a Kiddiewinkles Fire Engine Play Tent and although every bit of me screamed that this was probably a bad idea, something on the photographs made me stop and reconsider. It was a storage bag. A bag that neatly holds the whole tent and poles, so that nothing can escape and go for a wander, and everything returns to its compact size after play. Seeing as the boys are fascinated with the local Fire Service [and I’m very fond of Fireman Sam after reading law in Ponty], I delightedly accepted and the boys decided to have their licence plate embroidered with Jones Boys’ Fire Service. 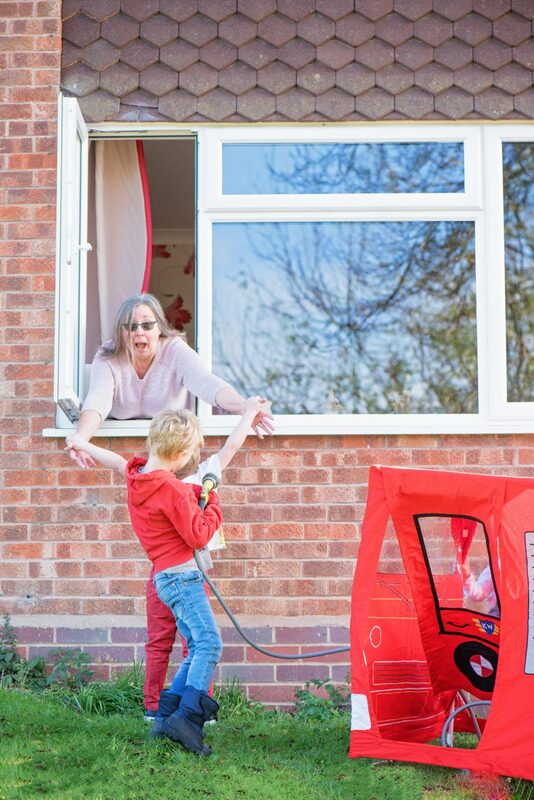 When it arrived, the parcel was pretty heavy, unlike play tent parcels we’ve had in the past – and this is because firstly, the frame is made from metal poles [hallelujah!] and secondly, the tent covering itself is thick – 100% cotton. No static hair in this fire engine – and it’s built to last. …that I assembled it. 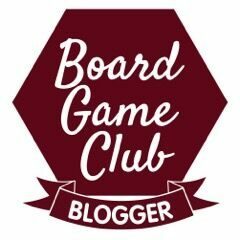 If you’ve read any of our toy reviews ever, you’ll know that I cannot follow instructions. Not ever. I see instructions and my brain shuts the doors. With this tent I had a bag of poles, a bag of joins, and three letters – A. B, C. One picture and it was assembled within 5 minutes, with Hero “assisting” too. If Father Christmas delivered this and wanted to set it up before he left, he’d be a happy man. …the quality. This is a REAL tent. This is an heirloom kind of tent that you know is going to last. It’s beautiful. Hand embroidery, appliqués – it’s made with such love. …there are TWO doors. This means that not only is it like a real Fire Engine, but there is far less arguing over who gets to control the door. …the half open top. 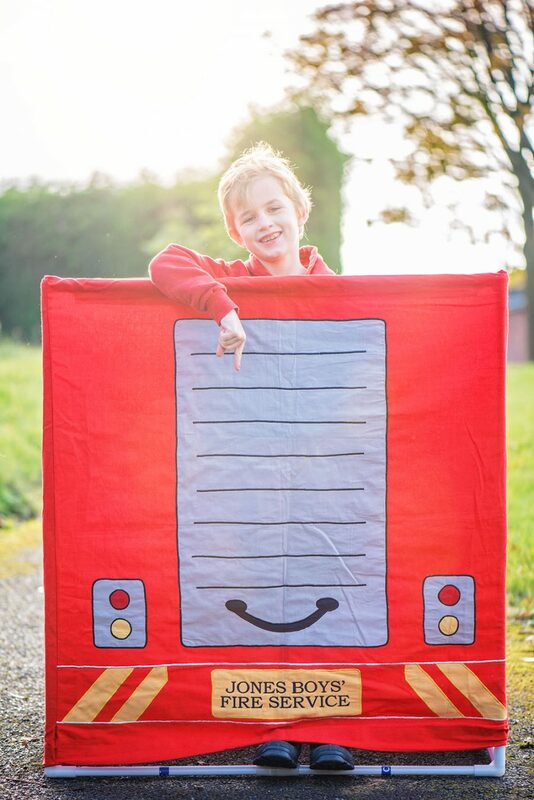 This lets the light in so they aren’t playing in the dark – and when they do want to play in the dark and it becomes a cave or something like that, it’s easy to drape a blanket over, because…. …the poles are sturdy and made of metal. This will not suddenly snap – and if the bottom part of the frame is knelt or stood on by little feet accidentally, it’s not going to be ruined. …the PVC windows mean no sagging, and no hanging out of. I’ve lost count of the number of arguments the boys have had when one of them has leaned through a window of a tent and sunk the whole thing to the floor. PVC means everyone can see through it and far fewer arguments again. …the bag. Never have I ever had a play tent that stores in its own bag. So neat, so tidy, so compact. If I could give this an award I truly would. …we’d discovered that there were Kiddiewinkles tents available when Jensen was born. I’d have saved myself so much pain, frustration and probably more than a few grey hairs and wrinkles. …I had a bigger house. This tent is huge – although a completely perfect size for actually playing in. 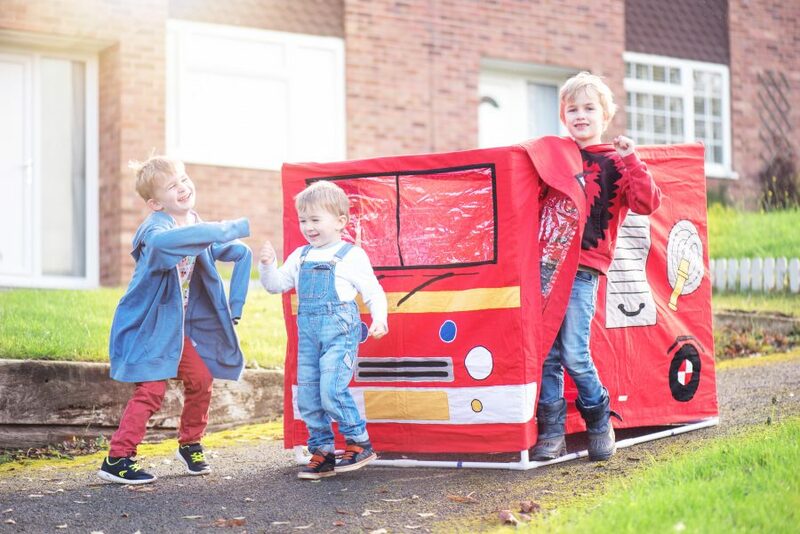 Our Verdict: If Father Christmas is looking for a high impact, WOW present, the Kiddiewinkles Fire Engine Play Tent is it. If I had come downstairs as a child to see one of these waiting for me, I’d have been the happiest child on the planet. 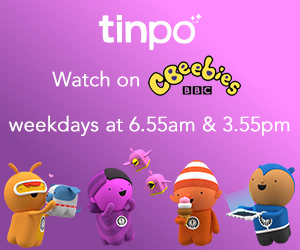 We can’t recommend them more.